When menopause hits, it can feel like you’ve hit a brick wall. Pounds start creeping in and no matter what you do, they won’t go away. On top of that, you feel sluggish and more exhausted than ever. Good news: There are simple steps you can take to start reversing the effects of menopause and get back to optimal health – if not better! Hormone fluctuations during menopause can bring about a number of unexpected changes, including extra weight. For some women, it gets harder to shed those pounds too. The good news is that menopause isn’t a sentence to feeling heavier, bloated, or two sizes bigger than you want to be. When you make lifestyle changes that account for your new set of hormones, you can experience vibrant health – and that includes balanced weight. While the age at which women experience menopause can vary by as much as a decade, the average woman begins to notice hormonal changes around the age of 50. This hormonal shift may feel like an upsetting change, but when you understand the processes happening in your body, you can adjust your lifestyle to end up in better health than you were before. Here are the top changes that may be holding you back. Estrogen balance is one of the primary changes that occurs during perimenopause (the decade before menopause officially sets in) and menopause. The primary form of estrogen during reproductive years takes a backseat to a different form, and some women can either experience too high or too low levels – or both at varying times – during this shift. Estrogen levels that are either too high or too low can lead to increased fat storage in women, making hormone balance one of the crucial ways to regain equilibrium with weight. Estrogen changes can also trigger other symptoms in women, like difficulty sleeping or insomnia. Lack of regular, restful sleep can also contribute to weight gain and a difficulty in losing it. Other hormones also get off balance after the age 50, including progesterone (which is primarily produced during reproductive years) and stress hormones like cortisol. This collective hormonal chaos can leave you feeling tired, gaining weight, and not feeling like yourself. In addition to hormonal changes, the thyroid can become sluggish around menopause. Sometimes, this is a result of the dramatic changes in estrogen and progesterone but in other cases, it’s an autoimmune response to a thyroid problem. The thyroid is a small, butterfly-shaped organ that sits at the base of the neck. It produces hormones that regulate metabolism, control energy levels, and have a role in mood balance, sleep, and weight. Estrogen levels can have a direct impact on thyroid hormone production, typically resulting in a sudden drop in thyroid function when estrogen levels begin to decline. Additionally, when hypothyroidism is present before menopause, symptoms can worsen in response to hormone changes, even if the thyroid condition was managed well by medication before. Both men and women naturally lose muscle mass as they age, but the decrease can be more dramatic in women during the change from perimenopause to menopause. Natural aging and hormonal changes influence this the most, but a tendency to become less active in response to weight gain is also a factor. Hormonal changes before and during menopause leave women more prone to insulin resistance than before. This is because hormones influence both how much and where fat is stored. Unfortunately, menopause causes more fat to be stored in the midsection, thighs, and buttocks, which can all increase the risk factors for insulin resistance. Bottom line: Women naturally experience hormone changes throughout their lives that can have a significant impact on weight, and the shift from menstruating years to menopause can be a major one. While there are several common factors that can make weight loss more difficult, there are natural ways to address them. Weight loss after age 50 isn’t impossible – you just need to know how to adjust your lifestyle to offset the hormonal changes. The gut microbiome plays a critical role in almost every body system, including immunity and digestion. The health of your gut can also influence estrogen receptors in the body. When it comes to hormonal changes, and estrogen levels that rapidly decline during hormone transitions, this can further exacerbate symptoms like hot flashes, mood alterations, and weight gain. The gut also helps regulate mood, with certain “bad” bacteria contributing to depression, anxiety, and mood swings. Weight loss and gain are also regulated by the gut, so an unbalanced microbiome can also contribute to the inability to shed pounds. The good news is that the bacteria in the gut respond swiftly to changes, so dietary interventions to promote good gut health and beneficial bacteria can work quickly for women struggling to lose weight or to stop gaining. While we are rarely under control of how hormones change during perimenopause or menopause, we do have a say in how we address those changes. Acupuncture can help to temper symptoms like hot flashes and insomnia and also provide relief and balance to an endocrine system that is temporarily chaotic. You can also help to manage uncomfortable symptoms by participating in regular yoga or meditation, both of which help to moderate stress and relieve discomfort. Your gut microbiome also affects your liver health, impacting how well the liver can detox and regenerate. When the gut is compromised, the liver is less effective in its tasks, like breaking down hormones and ensuring that the endocrine system isn’t bogged down. A liver-friendly diet includes eating plenty of cruciferous vegetables, like broccoli, Brussels sprouts, cauliflower, and cabbage. It’s also important to stay hydrated. Green tea, another detox-promoting food, can also help to reduce oxidative stress within the body which can protect the liver and increase the body’s ability to shed toxins that can contribute to hormonal problems. Women start losing muscle mass naturally after age 35, and unless they specifically work to maintain some muscle tone through regular training, that loss can increase and can contribute to continued weight problems. Research shows that women who participate in regular strength training have better bone density, and it can work as well as hormone replacement therapy. It can even help to temper other symptoms of menopause, including weight gain around the stomach. While opinions may vary on how much weight and how often it is needed to notice successful outcomes, even using hand weights at home a few times a week is better than doing nothing at all. 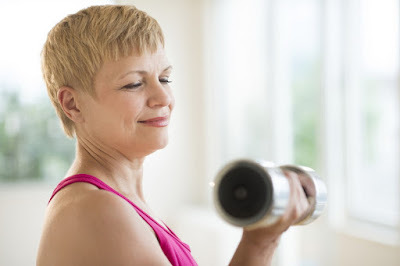 However, consider getting involved in a gym program utilizing kettlebells, hand weights, or working directly with a personal trainer who can help to find the ideal balance of weight and frequency for moderating menopausal symptoms. When women enter menopause, they naturally burn fewer calories. While many women may attempt to reduce weight gain by suppressing their caloric intake, research shows that doing that may actually lead to more weight gain. Muscle mass already naturally declines, but restricting calories can lead to further losses, as well as an increased risk of osteoporosis. Instead of restricting calories, focus on macronutrients, or the balance of carbs, protein, and fats. 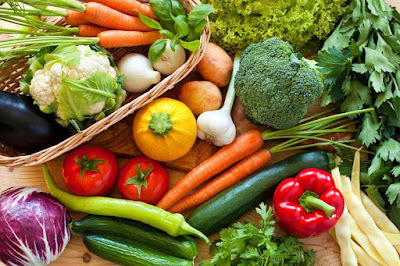 Carbohydrates are associated with more weight gain around the middle, so ensuring a regular intake of protein with each meal will help to keep blood sugar stable and reduce insulin resistance, while eating healthy, anti-inflammatory fats will promote better hormone balance. While you still need some carbs, choose high-fiber options from fruits, vegetables, nuts, and seeds, and skip grains and refined flours. You don’t have to be zero-carb to experience beneficial results, and many women notice that simply transitioning to a Paleo diet, which naturally avoids refined carbs and grains, is enough to jumpstart some natural weight loss. Hormone changes and other stressors can affect sleep quality, making it more difficult to get a solid night’s slumber. Sleep deficits can lead to difficulty losing weight, regardless of age, but in women over 50 it can lead to more fat storage in the midsection. To combat this increased risk of poor sleep quality, it’s important to create and maintain a healthy sleep routine. This means setting an established bedtime, limiting technology exposure for at least an hour before bedtime (there’s never been a better time to pick up a regular old paperback! ), and finding other ways to minimize stress and unpleasant symptoms. One way to promote more relaxing sleep and lower stress levels is to utilize aromatherapy. Lavender, specifically, can help to reduce menopausal symptoms. If hot flashes are an issue that impacts sleep, try sleeping with a fan next to the bed, and use several light layers of sheets and blankets instead of anything heavy. When a hot flash strikes, it’s easier to regulate body temperature by having layers of options instead of being confined to one extreme or the other. Stimulants like caffeine and sugar can have a dehydrating effect on the body as well as a destabilizing impact on blood sugar and hormones. In addition to causing feelings of anxiety and increased stress, caffeine can also worsen typical menopause symptoms like hot flashes and night sweats. If that’s not enough reason to quit, it can also contribute to bone density problems. Alcohol can also worsen hot flashes, night sweats, mood disruptions, and other menopause symptoms. While moderate consumption, such as less than one drink per day, may not have this effect, certain individuals are more sensitive than others. This is largely dependent on genetic individuality, liver health, and the gut microbiome. While caffeine, alcohol, and even sugar in moderation may not be deal breakers, it’s best to avoid these for the most part, especially if symptoms of menopause are problematic or if you’re having trouble losing weight. Instead, focus on nourishing beverages like water, bone broth, herbal tea, and green tea, and avoid foods that are overly stuffed with sugar. Bottom line: Losing weight – and keeping it off – after age 50 is not impossible and with the right strategy it can be easy to do. Sticking to these seven steps above can bring about faster success and help you to feel more at home in your own skin, in spite of changing hormones.